After long day forage at sea a White Tern returns the family with a fish. The White Tern (Gygis alba) locally know as Dhondheeni, sometimes called as Kandhuvalu dhooni is a small seabird traditionally only confined to the Addu Atoll, the southern uttermost atoll in the Maldives. However, the White Tern is commonly found across the tropical seas of the world and in the Indian Ocean. 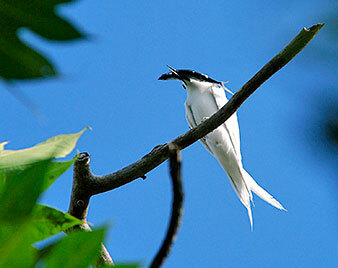 The White Tern is one of the most beautiful and interesting resident bird found in the Maldives. It has got all body white with black eye-ring and black bill with blue at the base. Legs and feet are also blue, with yellow to webs. In recent decades white tern has been proudly used as a symbol by the people of Addu Atoll to represent their atoll in the Maldives. The White Tern primarily feed on smaller fish which it catches by plunge diving down on the surface, but it does not submerge fully. It is a long-lived bird, having been recorded living for 18 years. This small sea bird is well-known for laying a single speckled egg on exposed thin branches in a small joint or depression without a nest. The thin branches it chooses is act of predator-avoidance behavior, crows (Corvus splendens maledivicus) and even rats avoid sitting or climbing small branches. However, terns are vulnerable to strong winds and the chicks have sophisticated sharp clawed feet to cling on fragile branches. A chick on its nest waiting for its parent to return with food, White Tern feed it chick more frequently than other terns. It is widely believed that the absence of crows in Addu Atoll has led to the successful flourishing of white terns for more than a century. When crows (Corvus splendens maledivicus) or any certain predator are around, white terns cooperatively attack or harass the intruders, normally in order to protect their young. Some argue that this is the main reason why there are no crows found in Addu Atoll. 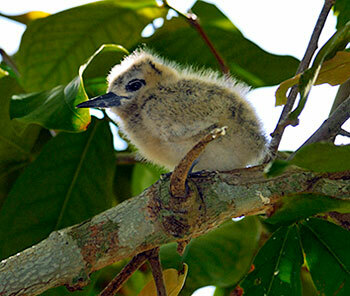 The main habitat of white tern is breadfruit, mango and other large trees in Addu Atoll. In early 1990s some of the White Terns have migrated to adjacent atoll and started to flourish in Haodigala: uninhibited island Ghaafu Dhaal Atoll. In Haodigala white tern's main habitat is wild screw pines (Pandanus tectorus), and it is widely believed that some of the terns have migrated to Gaafudhaal Atoll due to habitat destruction in Addu Atoll. White Tern is a protected bird in the Maldives; hence, their capture, sale and captivity have been prohibited. However, there are no vital conservation measures taken to protect the nesting habitats of White Terns. In order to flourish the white tern, the symbol of Addu Atoll, it is vital to protect the habitat of this beautiful and interesting bird. Yoosau, M ( 2000) Addu Kandu Huraskoh Huvadhu Attolhu ah ( White Term- Addu Sea Across to Huvadhu Atoll): Haveeru (Daily newspaper in Dhivehi).